The chance to travel the globe and view the world’s finest masterpieces up close allows us the opportunity to hold a mirror up to our own lives and explore the beauty and truth that lies within. In her latest novel, The Girl in the Glass, popular author Susan Meissner holds up the mirror and transports us to a new travel destination. The city is Florence, set in modern-day time; yet what makes this novel so unique is that Meissner weaves three stories together at once, enabling the reader to view Florence through the eyes of three women who lived at three different points in history. Meg Pomeroy is the book’s primary heroine, and it is through Meg’s eyes by which we are led. Meg is a young, successful 30-something who works as an editor at a publishing house that specializes in travel books. Sofia Borelli is the last of the Medici dynasty and owns a tour guide company with her father in Florence. Sofia’s story begins to surface initially through the pages of a manuscript sent to Meg by one of her authors. Then there’s Nora Orsini, a mysterious Italian princess whose story of loss, heartbreak, murder and tragedy is told intermittently throughout the novel. The primary storyline—an easy one to relate to—follows Meg. She’s a single female mending from a broken relationship, dealing with the daily stress of a growing career, and battling an emotional rollercoaster courtesy of her parents’ divorce. Her mom is dating a much younger man, and her father—now remarried—has proved an unreliable, unstable force in her life. Even now as an adult, Meg still longs to have her father be a part of her life. So, when a plane ticket to Florence arrives unexpectedly at her doorstep with an ambiguous note from her dad, Meg is all at once delighted and suspicious. Her Italian grandmother always wanted to take her to Florence when she graduated from high school; but when she passed away, her father promised to fulfill her dream. When she arrives in her long-awaited destination, her father is nowhere to be found, and Meg is left to experience her lifelong dream alone and come to terms with yet another broken promise. Meg discovers more than she bargained for in Florence—fulfilled dreams, hard truth and even romance. She ends up calling on prospective author, Sofia Borelli, to function as her tour guide while she’s in town. It’s through the face-to-face encounters of Sofia and Meg where the reader begins to see their stories intersect as they have meaningful conversations over wine and cappuccino or standing before some of the greatest artwork in history. It’s also in the midst of dialogue and historic places that Nora’s story comes to fruition. The renaissance happening within the lives of these three women unfolds as Meg and Sofia wander the narrow, cobblestone streets of Florence, absorbing its beauty and learning from the artists, sculptors and painters who made the Renaissance a time of transformation and rebirth. Meissner not only mines the depths of human emotions, but she educates us on the revered masters of the arts and some of their greatest life’s work—David, The Annunciation, the Duomo. 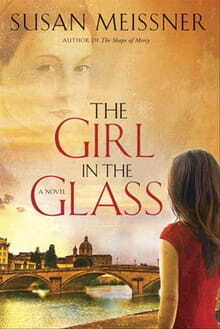 To read The Girl in the Glass is to meet the masters of the Renaissance—Botticelli, Michelangelo and Brunelleschi. Their art tells the stories of celebrated heroes, saints and sinners, and in turn, tells our story. Meissner is poetically brilliant as she weaves the tales of these three women into a beautiful tapestry filled with mystery, intrigue and clandestine secrets. As the paintings, sculptures and architecture of Florence are brought to life under Sofia’s colorful commentary and Meg’s awestruck gaze, beauty is revealed, hurts are healed and relationships are mended. Meissner’s book is proof that good art does indeed imitate life. It’s more than a mere history lesson; it’s an unforgettable experience. The Girl in the Glass will have you booking a flight to Florence in no time!